Pheasant Glen Golf Resort is a par 72, 6,928 yard championship course in Qualicum Beach. The slogan, Nature’s Golf Course, perfectly suits this secluded enclave, devoted solely to great golf in a natural setting. Pheasant Glen is undisturbed by houses and highways and is delivered with customer service second to none. Pheasant Glen is a true test for the low handicap player, but also offers interest and intrigue to players of every level. All the par three’s are different, yet all are very challenging, and Pheasant Glen boasts “the three toughest finishing holes in BC” according to BCGA Executive Director of 2006 & 2007. Three rounds of golf and two nights in an ocean-view suite in beautiful Parksville, BC. A Stay & Play golf package where you don't mind playing in the sand (on the beach that is). Two nights in Parksville and rounds of golf with power carts at Eaglecrest, Fairwinds & Pheasant Glen. This is the easy-going island pace at its finest. Pheasant Glen’s front nine winds through high grass, meadows, and creeks, all framed by the peak of Mount Arrowsmith, while the back nine zigzags through a heavy stretch of Douglas fir and features a finishing punch that may be the most memorable in the province. The sixteenth hole is a narrow, 520-yard, par five that dares big hitters to try for the green in two. Go too far and the ball splashes down into the hazard that wraps around the back of the hole. The seventeenth is a 420-yard, par four with water squeezing the fairway on both sides of the landing zone. The eighteenth measures 582 yards from the tournament tees and after giving it all you’ve got from the tee and fairway it demands you to be accurate with your approach to stay out of the water and bunker left and a bunker right. 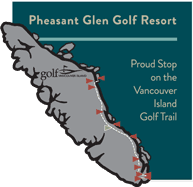 Pheasant Glen is a proven Championship course having hosted one National and two Provincial Championships from 2006-2008 and was the proud host of the 2016 BC Amateur Championship.